We all know how to handle ourselves in a face-to-face meeting or on the phone, but chairing a videoconference requires a whole different set of skills. Firstly, preparation is important, and can make the difference between a successful video conferencing session or presentation, and an awkward one. It's important to dress appropriately for the video conference, just as you would for a physical meeting. 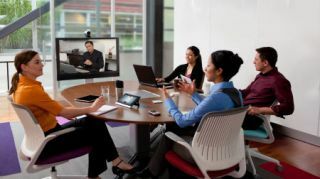 The main difference is that you will be viewed onscreen, so dressing in dark, solid colours or neutral shades will most likely come out better on screen when it comes to the videoconferencing presentation. You should try to avoid wearing horizontal stripes and patterns, reflective clothing and very bright colours and make up, which may not render well on a laptop or desktop screen. It's also important to prepare what you want to say, and if you need to, script everything. This will help you stay on message, and remember the main points you want to make. If you are delivering a presentation, it's also worth practising it beforehand, and if possible, even video yourself doing it so you'll know what other people are going to see and hear. Another part of the preparation is to make sure you know how to use the videoconferencing technology, and any controls you will need as the presenter. This is particularly important if you are using a sophisticated system, in which case, it might be worth doing a test run before the meeting commences, to make sure the lighting is right, and the chair and microphone placements are optimised for you. Just like an audio conference, it is worth logging into the session before the meeting actually starts, so you can begin it on time, and welcome participants as they join. If you are chairing the meeting, you can remind people to do likewise in order to minimise the chance of people arriving during the event, which can be disruptive. Just as you would in a physical meeting, make sure you speak clearly and slowly during the video conference itself, and repeat questions where necessary. You might like to use humour to engage people, if you're comfortable doing that, and if it's appropriate. Also, try to relax and breathe normally, as this will get the best out of both yourself and the participants. Although you will be looking at a camera, try to maintain eye contact with it, because this will mean other people will be able to feel they have eye contact with you. This is important in videoconferencing, which is emulating a physical meeting. However, unlike a physical conference, small movements can be picked up and exaggerated, so try to stay still and gesture as normal. For the sake of politeness, try to avoid doing other things, like checking your smart phone, typing into the computer, turning away or walking around. People are going to be concentrating on your face, particularly if you are the presenter, so make sure your facial expressions are appropriate, and that you are engaged and interested in the presentation and what other people are saying. Also, remember to smile and relax. To facilitate conversation, and moderate debate and interactions, try to allow people to finish what they are saying without interrupting them, or letting other people interrupt them prematurely. You may also be required to moderate multiple conversations by explaining the ground rules, and encouraging people to participate. Again, it is worth speaking clearly and carefully, enunciating your words and using inflection to vary your tone. Also remember short words and simple sentences are better, as there may be a brief time delay in the audio transmission. There are several things you can do to make sure you present well, and these include practising with the equipment beforehand so you're comfortable when it comes to the meeting. Knowing your material is also important, as is having a glass of water at hand in case you dry up, and setting time aside for relaxation before the presentation. If you are doing a presentation, or leading discussion using an interactive whiteboard or an online poll, then clarity, brevity and confidence are all important qualities to demonstrate, because they will help you to lead well and be decisive. In addition, using the interactive tools that are available, such as instant messaging, shared whiteboards, and online polls, can help to keep people engaged in the presentation, encourage participation, and they can make the presentation more interesting. Finally, in terms of timing, this may vary depending on whether you are incorporating multiple countries and time zones, but if you want people at their most alert, then morning conferences are the best option, and it may be better to avoid the after lunch slot.